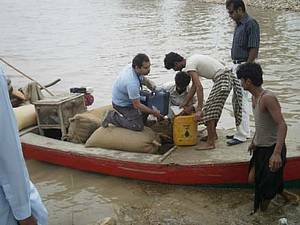 Rescue and relief is the current priority for WWF-Pakistan in the numerous communities it works with in the flood ravaged Indus basin. Lahore, Pakistan - Rescue and relief is the current priority for WWF-Pakistan in the numerous communities it works with in the flood ravaged Indus basin. “We know the floods have caused enormous environmental damage and that reconstruction will take a long time. But the need at this time is to help families cope with the immediate aftermath and try to manage the risk of disease,” said Ali Hasan Habib, Director General of WWF-Pakistan. WWF-Pakistan has spent three years working with 11 impoverished communities dependent on the wetland ecosystem in the vicinity of the Taunsa barrage and Kot Addu, a city of 8 million in southern Punjab. “As the flood waters in the main stem of the Indus began to peak in early August, it became clear that a life-threatening situation was developing quite rapidly,” said Richard Garstang, former National Programme Manager of the Pakistan Wetlands Programme (PWP). “Military and other government personnel were present, but thinly spread. They couldn’t reach everyone in need. “We mobilised PWP and local resources into a team equipped with eight motor boats to rescue 1,387 stranded people from riverbank and island villages. We relied heavily on our good working relationship with local Wetlands Conservation Committees. Fortunately, village elders were able to persuade community members to leave their properties in the face of the flood, and seek safety. “Once the community members were safe, the PWP team delivered 15,000 doses of anti-malarial and anti-histamine drugs to five temporary medical centres that had been set up with support of the Punjab Department of Health and a local organization, Saiban Welfare Foundation. Other impacts are already anticipated. Rare river dolphins are being affected by the deluge. All barrages and canal gates in the Indus' extensive irrigation system have been opened, allowing large volumes of water into areas that normally receive only low flow. While it is difficult to predict the consequences for Indus river dolphins, it is likely that populations will move outside their normal territory. This could pose major problems when water levels fall and the dolphins find themselves in areas where there is not sufficient water. WWF expects that when the floods recede there will be an increase in the number of strandings in irrigation canals and is preparing to deal with numerous rescues. In several areas, WWF-Pakistan has managed a long-running project to improve water efficiency in production of cotton, the country’s main agricultural export. In WWF’s Rahim Yar Khan office, to the east of the flooded river in central Pakistan, cotton project officer Muhammad Abu Baker said the continuous and heavy rain meant that “fungal diseases on the cotton crop have increased, as have sucking pest attacks”. “There is water lying three to four inches deep in every cotton field,” he added. “Farmers try to pump it into the neighbouring sugar or rice fields, but the next day it starts all over again.